The state of the economy and how a party is perceived in terms of their economic competence is a key influence on voter behaviour. Recent evidence of this link was clearly seen at the 2007 General Election, when Fianna Fail won more support than many expected, partly because voters simply trusted them more with a wobbling economy at the time. Given the importance of this link, it is vital for the current coalition that they begin to benefit from any improvement in the economy in Ireland. It would certainly have been a strategy for both government coalition parties, to weather the storm of harsh economic budgets for the first half of their term in office. In the hope that improving conditions would allow them to be seen to have pulled Ireland out of the downtimes and so consolidate support in the run up to the next General Election. In our regular Sunday Business Post polls, we regularly look at how voters perceive the government parties in terms of economic competence. The expectation being that as this measure begins to improve, we might begin to see a resulting gradual improvement in support for the parties in power themselves. To put this into context, for the first two years in government during a very tough recession, there have been less voters who trust the coalition with the economy than say they would vote for them. This year, despite some early signs of improvement in the economy and gains in consumer confidence; as yet the coalition do not appear to be reaping any rewards for this. 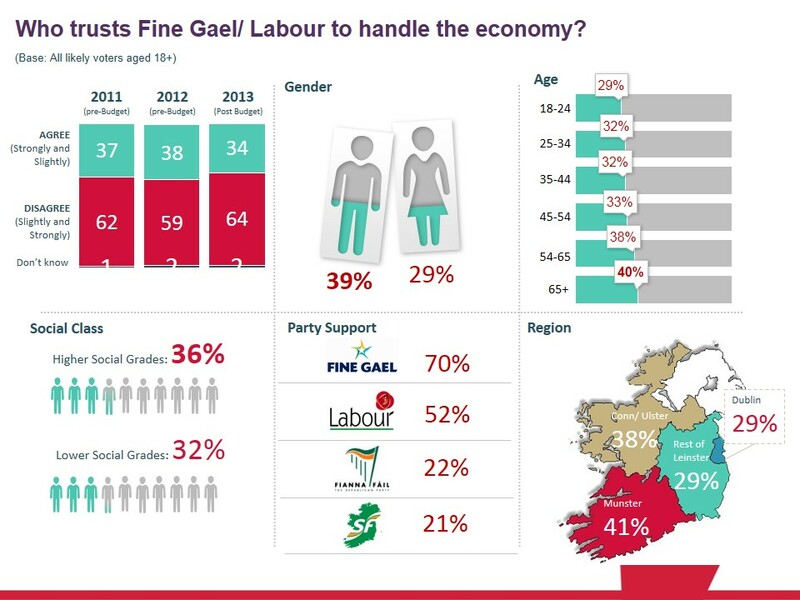 In fact the proportion of voters that trust Fine Gael and Labour with the economy has declined in the past year. It currently stands at just over a third of voters (36%), down 2% from a year ago. The real insight comes however when we look at “trust to manage the economy” by voter type. While 70% of current Fine Gael supporters trust the coalition with the economy, among Fine Gael defectors (those that claim to have voted for the party in 2011 but won’t support them now) just 14% trust the coalition on the economy. Suggesting this is a major factor in defection. The same analysis for Labour produces a slightly different picture. A far lower proportion (52%) of current Labour supporters trust the coalition with the economy in the first place. On first glance this would suggest that economic competence is key for Labour. However, the gap on economic competence among current supporters and Labour defectors is far lower than for Fine Gael, with 30% of Labour defectors still stating that they trust the coalition on the economy. This suggests that as the economy improves it is likely to be Fine Gael that gains more so than Labour. And while an improving economy may help Labour to some extent in the future, this perhaps has to be in conjunction with an improving perception among lost Labour voters that they are fighting for “Fairness” in government as well.